Desperate to know how to use a fermentation crock to make sauerkraut and kimchi, or some other healthy and delicious fermented food? I've got a treat in store for you, we're going to get in-depth and geeky on how to use fermenting crocks, and by the time we're done, you'll be totally confident to get started. 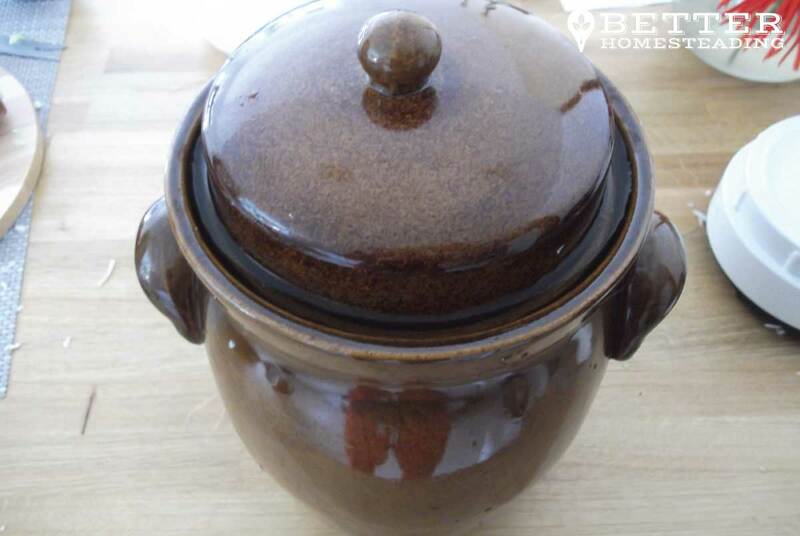 Check out my pick of the best fermentation crocks if you haven't already got one. I hope it helps bring some clarity. This is the one I use and it's freakin' awesome. I've been fermenting in a ceramic crock pot for a couple of years, after messing around for ages using Kilner jars and jam jars. Yes, you can surely do it that way, but once you've experienced the large scale (I'm talking 2 - 3 heads of cabbage) production of fermented vegetables in a crock, you'll never look back. The principles aren't that tricky to understand. If you have no idea about fermenting, check out this article I wrote on how fermentation works. It covers the principles behind aerobic and anaerobic fermentation, the latter being what we are aiming for when fermenting beets, sauerkraut, kimchi, curtido, or whatever other vegetables we may have on hand. I'm going to try to keep this fairly brief, so as not to bore you, but it's important that we know some of the basic principles behind fermenting. If you didn't read the article I linked to a moment ago, check out this video for a few minutes. As you've likely gathered if you watched video or read the article (here is the link again) the process that is involved in the fermentation of vegetables is called lacto-fermentation. It's a process that takes place without the presence of oxygen. In fact, if oxygen does find it's way into the fermenting vessel, the food inside is likely to go mouldy. Lacto-fermentation has been happening for millions of years, well before we were human. It was probably discovered by ancient people who stumbled upon fruits or vegetables that had fermented, and were good to eat. Thousands of years of culture have kept the lacto-fermentation process alive, and more people are using this great way to preserve food, and to increase the nutrition of that food. When vegetables are picked, they have natural yeasts and bacteria on the surface. Even with a light wash, those organisms remain. When placed under liquid, with the vegetables or fruit removed from an oxygen supply, these micro-organisms go about their business eating the sugars that are released from the fermenting produce. 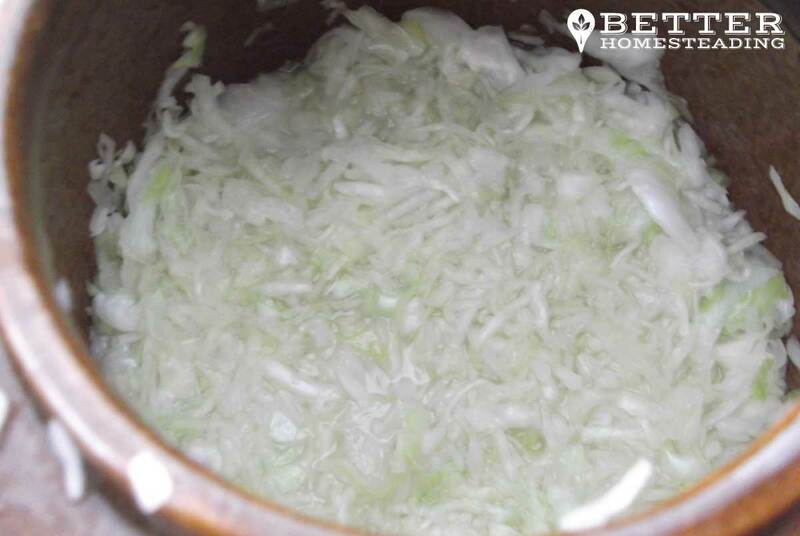 When we ferment, we use salt to draw the liquid out of the cabbage or vegetables we are using. We shred them, cover with salt and allow the liquid to be released. 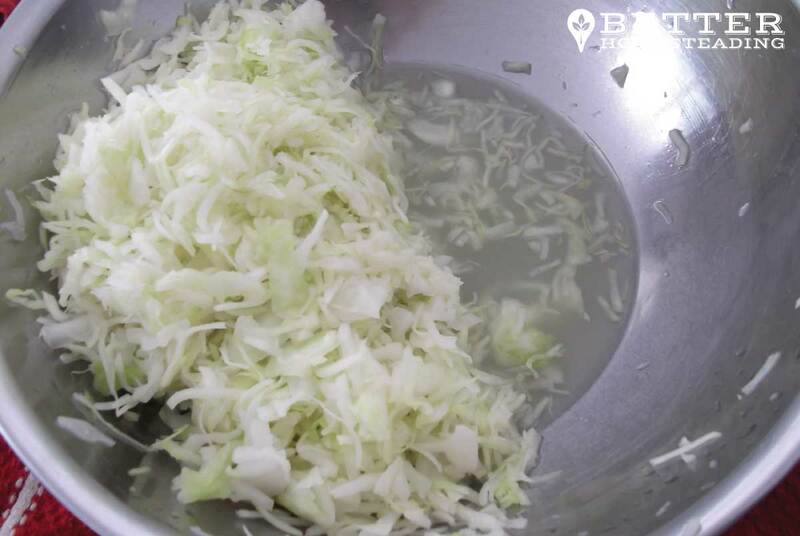 If you squeeze the shredded cabbage with your hands, and keep doing this, lots of water is released and the shredded cabbage becomes limp. What's really cool is that the salting kills off bad bacteria that could be potentially harmful, while leaving the beneficial ones alive. Once in a fermenting crock or jar, and submerged under liquid, the second stage of the fermenting process starts, with those lactobaccillus organisms starting to break down the lactose and other sugars in the vegetables. These organisms produce lactic acid as a waste product, and this is why the environment in the fermentation crock pot become acidic. This gives the food a slightly tangy flavor while preserving the food and giving it a longer shelf life. It's for this reason that ensuring the cabbage or other vegetables are kept under the surface of the brine solution, and air is excluded at all costs. This can surely be done with a large jar and the use of weights to keep the shredded vegetables below the water surface. 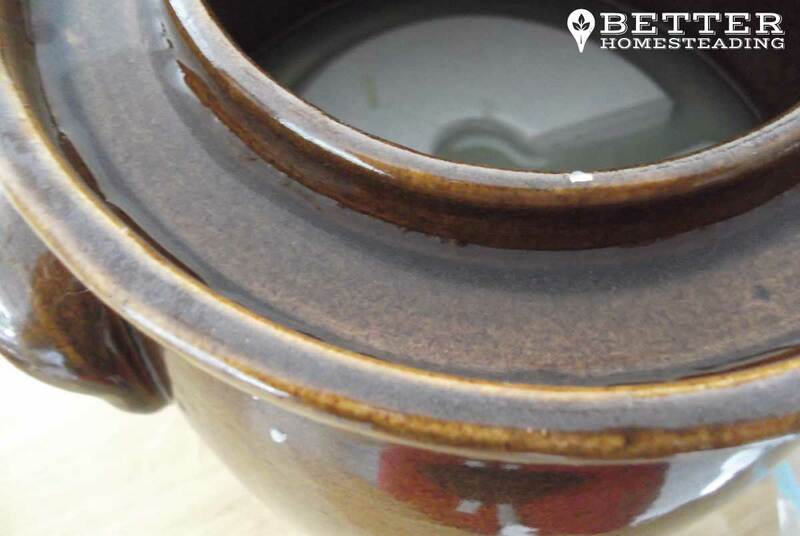 The ceramic fermentation crock goes one step further than a simple jar setup, but having a 'u'-shaped water holding groove in which the lid sits. 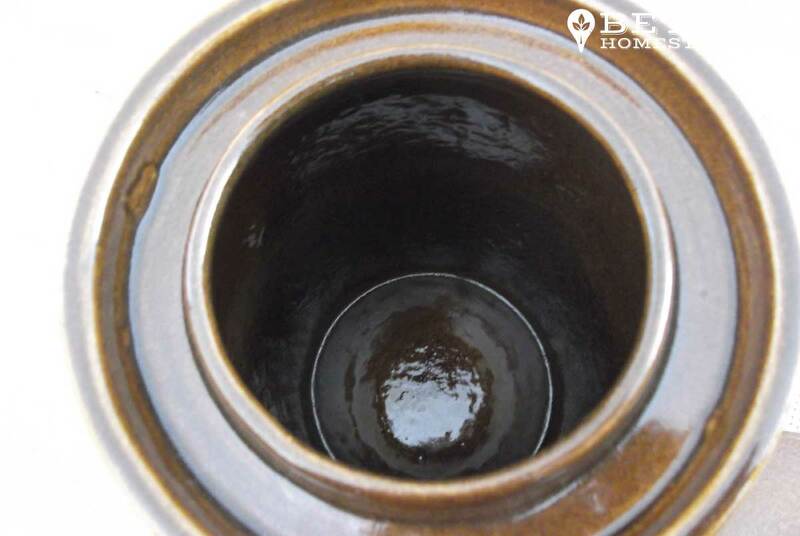 Gas can escape by bubbling up and out of the jar from under the lid (due to a positive pressure being built up in the crock) but air cannot get back inside. A virtually oxygen free environment is created, which makes for fast and efficient fermentation. Jars work well for making naturally fermented foods, I started with them but they do have a number of limitations, which can be overcome of course, but once you are a committed fermenter, I think you'll find the crock option your best choice. Just for your information, because I have been asked this a few times, I bought my crock on Amazon, it's a German product and is a 5 liter crock. Here it is on Amazon. As yo've probably guessed, I'm totally over the moon about having a crock. It's made life SO much easier. I started with jars, got the hang of things, but to be honest, when you eat a lot of fermented food like I do, filling a few jars is nice, but it's all eaten within a week. Another issue I had was that, although jars are relatively cheaper per unit, if you did want to make a good amount in one go, unless you have access to free jars, you'll spend as much money on jars as the crock, for the same volume capacity. Plus I prefer one crock over 20 jars to do the same task...maybe that's just me! Here are a few considerations you might want to make before setting for jars vs a proper crock for fermenting. To be clear, you can get a good result with either storage medium. One is simpler, the other more fiddly, but don't not start your fermenting journey because a ceramic crock is out of your price range right now. Open crocks like the Ohio Stoneware fermenting crocks are an excellent choice, although you'll need to work a little harder to create the air-free environment your fermented veggies need. Start with jars, see how you like it, and upgrade when you have some cash. So, all good fermentation crock pots should come complete with weighing stones. These are designed to hold your fermenting vegetables below the surface of the water. Although air will be limited in the crock once the fermenting starts and gasses build up in the remaining space at the top of the crock, we want to keep our cabbage (or whatever you are using) submerged. I'll get back onto that as we proceed through the steps, but it's a great idea to soak the stones (which are somewhat porous) in water, or even better, in water with a little apple cider vinegar added. The vinegar, being acidic, inhibits bacteria from getting in or on the stones. 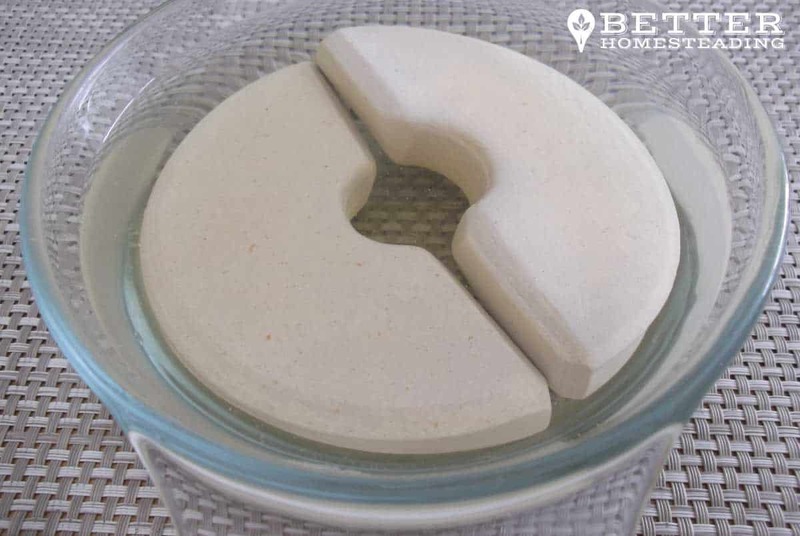 Secondly, being porous, you don't want the stone sucking up the liquid in your crock. We want the water level above the vegetables, pre-soaking the stones will stop them sucking up any of your precious fermenting liquid. This seems like common sense, and I think it is, so won't harp on about it too much. Always wash your crock out when you've finished a batch of kraut or kimchi, and store it in a clean dry place. When the exciting time comes to use it again, wash it in some hot soapy water and rinse. Leave to drain. I never bother sterilizing my crocks or jars, I just wash them with hot soapy water. Never had an issue. As with any food product, if it grows mould, smells awful or just seems wrong, discard it and start over. There is actually a slight exception with fermenting, I'll discuss that a little later. If it's a time of year that I'm not growing my own vegetables, I will purchase whatever is seasonal, and ideally not too pricey. I like white cabbage kraut, but I'll often shred some carrot in there too, for a little color. You can actually ferment pretty much anything, I'd advise getting the basics down, an then going to town with some wild experimentation. 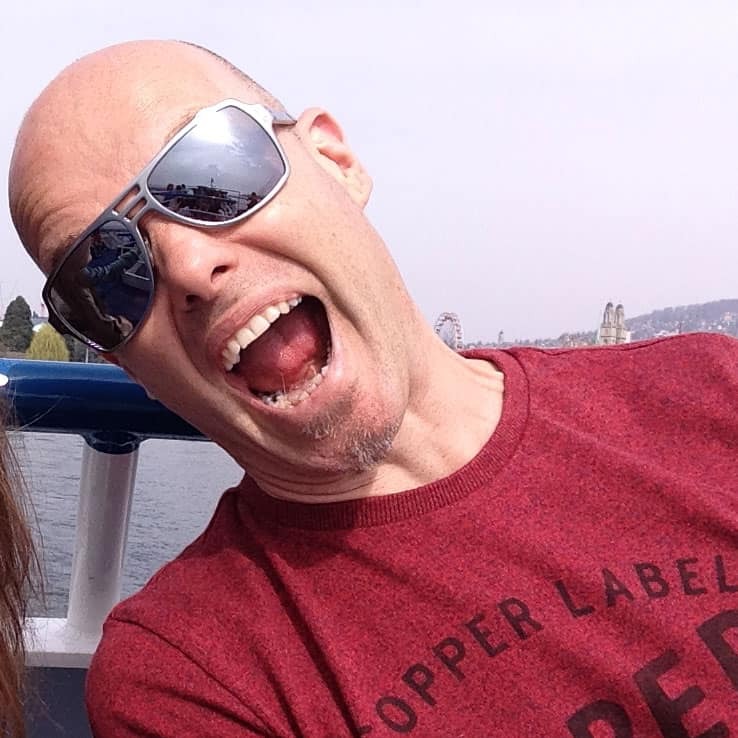 If you create something awesome (intentionally or by accident) let me know. Anyhoo, you're going to want to rinse your vegetables and remove the outer leaves (reserving two for later), peel the carrots etc. The vegetables will have natural yeasts, bacteria and organisms on them that will play a role in the fermentation process, but a rinse under the tap is not going to remove those. It may just remove some other things you don't want to eat. Pesticides, dust etc. Now, you can certainly use a food processor with a blade attachment to shred your cabbage or vegetables. I did that for a while. 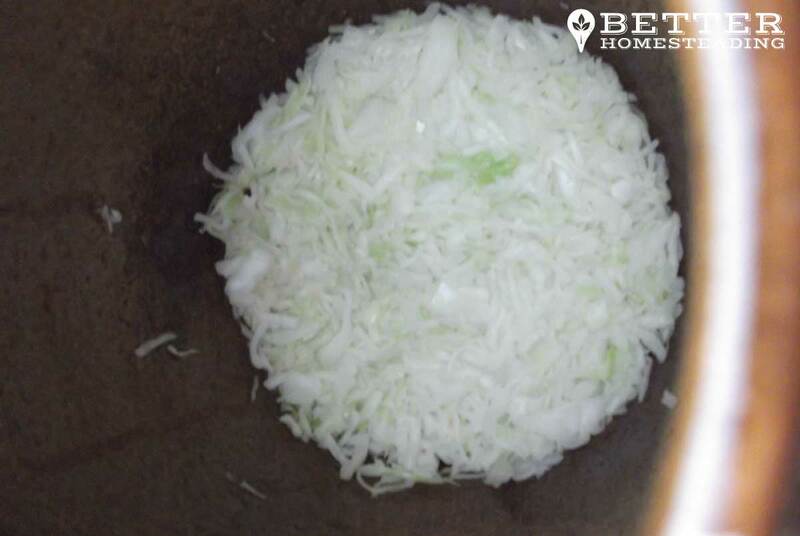 Unfortunately, most food processors have a very limited capacity and you find yourself constantly filling it, having to take the lid off, clear and clogging from the blade, empty the cabbage into another bowl or bucket. Do this 10-20 times for a big batch, you'll soon be fed up. So....I started just shredding it with a large knife. I quarter the cabbage, chop out the tough core like in the picture below, then just shred it on a chopping block. It's cut down the processing time massively and it's actually pretty easy to shred it finely. Fine enough is good enough, you don't need gourmet chef skills for this task. 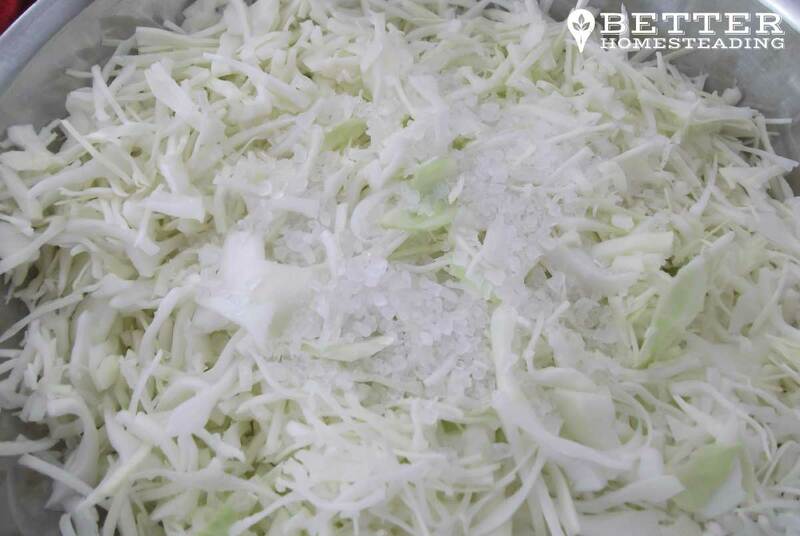 Salting the shredded cabbage/vegetables is an essential part of the process. It causes them to release water from the cells (most vegetables have a high water content). I wrote an article on the best salt for fermenting, take a look at it if you would like some more detail on which salt to use. There are many varieties that are fine, just avoid those with additives and anti-caking agents. I like Himalayan mountain salt and Kosher salt. I aim for one tablespoon of salt per head of cabbage. Throw the salt on and use your hands to combine the cabbage and salt. There are a couple of other ways to do this, I've listed them in the next step. This is the fun part! Getting your (clean) hands in amongst it and squeezing, turning, bashing, punching, smashing those vegetables. Sounds rather violent, pummelling those poor plants into submission. Don't worry, they like it, and you'll shorten the preparation process. If you don't have strong hands, or just want to take the easy route (you're a human after all), there are a couple of other options. 1. Salt the cabbage as usual, toss to coat, and leave in a covered container for an hour or two. Toss again and repeat until the cabbage is limp. Once this is done, you are ready to pack your cabbage /vegetables into the crock. Reserve the liquid, you're going to use this to top up the crock to ensure the vegetables are totally covered in liquid. 2. Create a brine solution with your salt and some filtered water. Soak the cabbage in the solution. You can then use this brine to top up your crock when you've compacted the cabbage into it. I like to get the job done quickly, so usually just use my hands to squeeze and turn the vegetables. That said, it can take 10 mins of squeezing to liberate the water from the vegetables. One's hands can ache a little 🙂 You choose which method you like, or just experiment with each one or a combination. Spices are not always needed when making sauerkraut, I often like to prepare just a very simple white or red cabbage kraut with no additional flavors. But, adding Caraway seeds or some other herb/spice can really jazz up your kraut. Obviously, for Kimchi, spices and seasonings are integral. For kraut, I like to add the seeds/seasonings to the wilted mix, just before I pack it into the crock for it's final journey from raw ingredient to deliciously healthy fermented condiment. I take a handful of wilted vegetable at a time and pack it into the crock, using my fist to press it down. 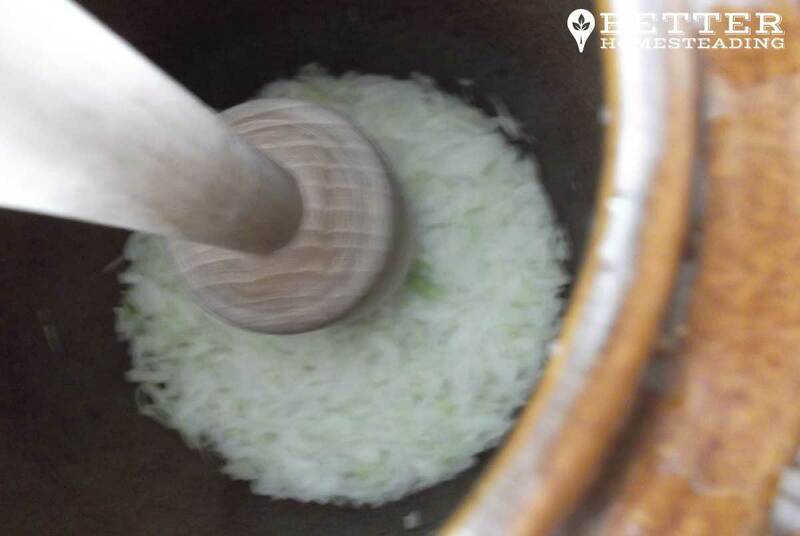 I then use a cabbage pounder/masher to press it down more tightly. Whether you have a basic cabbage sauerkraut recipe, or have created a Kimchi mix, with spices, carrots, garlic and other additions, the process is the same. Pack it into the crock as tightly as possible. 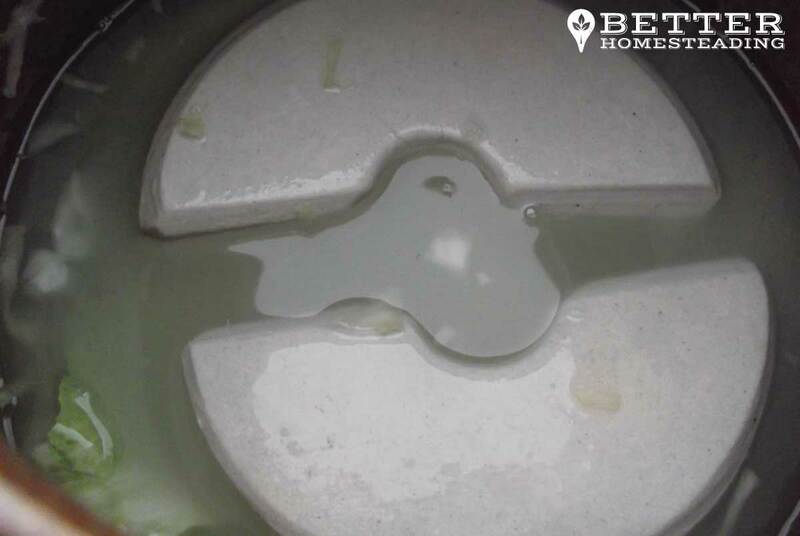 You'll see (and will want to see) liquid forming on the top of the mix as you pack it down. Keep adding your vegetables, compacting well every few inches you add. Fill the crock to 2-3 inches below the neck. Really work to pack the shredded vegetables down here, you should end up with an inch or so of liquid on top and covering the veg. If not, don't panic, we can fix that! 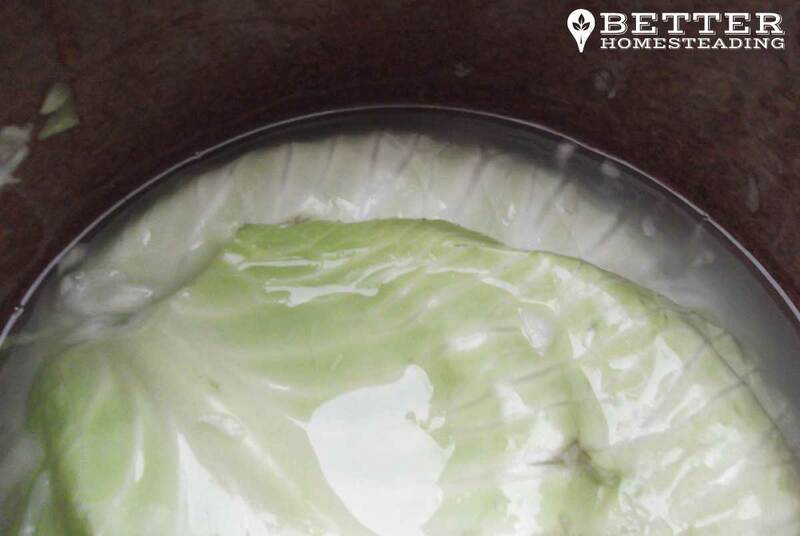 If you have extra liquid left in the container you used to squeeze or sale your cabbage (or whatever you are fermenting), you can pour some of that over the top of the veg in the crock to cover. Don't get excited and fill the crock up, I'll tell you why in a moment. If you have no liquid, you can make up a little brine solution, or even just add some filtered water to cover the vegetables in the crock. Simple! Ok, so we are looking to keep the veggies underneath the liquid throughout the fermentation process right? Although you are compressing it down well, things can float to the surface. With a crock, it's not a massive deal as the water seal prevents air coming back into the crock, but some can get in when you take the lid off for example. I like to take a couple of cabbage leaves that I reserved at the start. Place them into the crock on top of the shredded stuff and using your fingers, press the edges down the sides of the crock, between the crock and the vegetables. You looking to create a 'cap' that keeps the cabbage down below the surface of the water. It's simple to do, just do your best. We're going to use stones to weight the cabbage down anyway, but this cabbage leaf cover is pretty useful to use. So, you now have the shredded veg under the surface of the liquid, hopefully being held down with strategically positioned whole cabbage leaves. you can how take the weighting stones that came with your crock, and place them inside on top of the leaves. Press them down hard and you'll see move liquid rise. If you have filled the crock a little too much, you may have to push them in carefully and they will sit just underneath the neck of the crock. 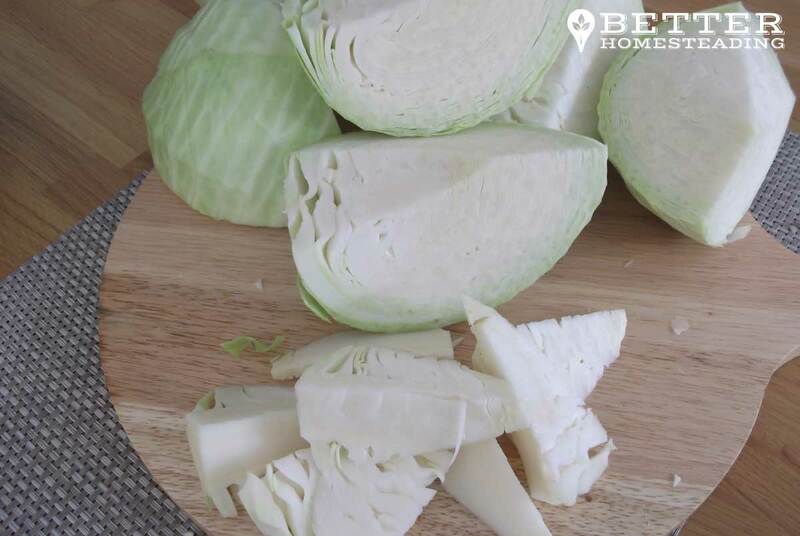 The cabbage will continue to release water as it ferments, and overfilling will result in liquid bubbling out and filling your water gutter. If you don't put the whole crock in a shallow bowl or on a plate, you may end up with water on your counter top. So keep an eye on things. If water is leaking out, lift the lid and scoop a little out. Best not to overfill in the first place though. Almost done. Place the crock where you are going to store it, ideally in a relatively cool area, and add some water to the gutter. See in the article below I have roughly half filled it. Too much water and when the lid goes on and displaces it, you'll have water on the floor. You're going to need to keep an eye on the gutter water level every couple of days, it does evaporate. You just need to keep it topped up. You will see (and maybe hear) gas being released from the crock in the form of bubbles appearing on the outside edge of the lid where it meets the water. Stick the lid on and you're done. Clean up the kitchen and have a cuppa. The fermentation process to make naturally fermented foods tends to take a week or two, or even 3, leaving it longer is fine, too, but 7 days is generally ideal in warmer temperatures. If will continue to ferment a little when you transfer it into jars, unless refrigerated. Do a taste test after a week to see if it is tangy enough for you. If not, replace the lid and wait. I really hope you get yourself a fermentation crock. You'll never look back when you have one, I can promise you that. Any questions or observations, leave a comment in the comments section below. Would love to hear about your fermenting adventures. Great to see someone ranting about the benefits of fermented vegetables. It’s all becoming quite trendy now, and easier to buy in the grocery store, but that stuff is nothing like making it at home for yourself. I use a crock, I did use mason jars as I am a bit of a cheapskate, but the crock really does work great and is a real timesaver for me. This is a good blog post, It’s obvious (to me, from the photos) that you do this stuff for real, and aren’t just trying to sell me something. I appreciate that as it’s hard to know what and who is authentic these days. I’ve used mason jars too, but don’t anymore. Did you read my article about that before you came to this one? If you didn’t, it’s HERE. Really enjoying your site right now. It’s come at a great time when I am just getting into fermenting my own vegetables. What I want to ask is this: Just how important is a proper crock. I’m a student and don’t have a lot of extra money, wondering it I can get away with just using mason jars or something similar? Is it really worth the extra cost of a german style crock? Thanks for dropping by. I love to get comments, makes it all worthwhile. In answer to your question…..You definitely CAN ferment perfectly well with mason jars or any other wide-mouthed jar. If you have some already, then go ahead and start your journey with those. However, if you don’t have them, then it’s worthwhile considering that you are going to need jars for the fermenting process AND for storage. 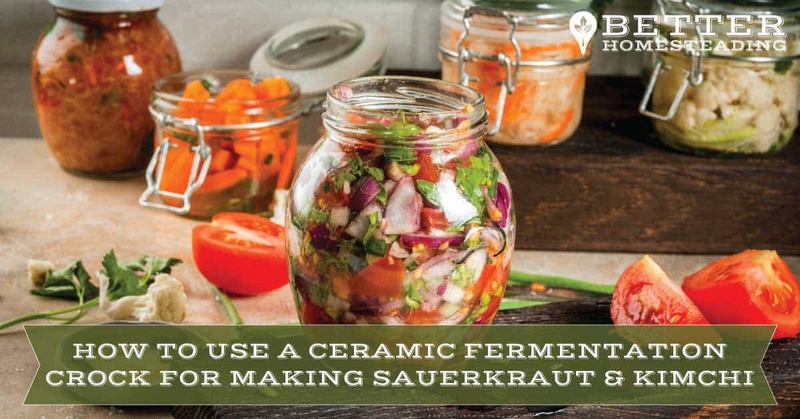 Yes, you can ferment in a mason jar and then use it to store your kraut or kimchi, but unless you have a good few jars, you are going to run out. Mason jars aren’t cheap either. 5-6 of those will cost as much as a low coast crock, so although the unit price is cheaper, it is a bit of a false economy to think that jars are a cheaper alternative, UNLESS you are going to be fermenting really small quantities. Let me know if they help, or give me a shout if I can do anything to help. after four weeks of using my fermentation crock for sauerkraut. can i store it into quart jars and refrigerate them. is there a process of how to do that with or with out liquid, lids or no lids?